Here in one 6-volume set is the incredibly useful All You Need To Know About The Bible series. This must-read resource gives concise, rigorously researched reasons for the inspiration, formation, claims, transmission, translation, and interpretation of the books of the Bible. Great value! No other book than the Christian Bible has had such a wide influence on the moral and legal background of Western nations, or upon their art, literature, music and films. Take away the Bible from Rembrandt and Leonardo da Vinci, from Milton and Byron, from Handel and Sibelius and our heritage would be sadly lacking. Volumes have been written - and continue to be written - with this book as their subject: books on science and history, trivial novels and serious enquiries, plays, poetry, prose and drama. Each year literally thousands of books, articles and papers with the Bible as their subject pour into the bookshops and libraries and onto the tablets, iPads and smart phones of the world, and movies make money when they make the Bible their theme. More copies of the complete Bible are printed and distributed each year in over five hundred and fifty languages (and rising annually), than any other book. The Bible moulded the English language as we know it. Shakespeare was familiar with the translation known as the Geneva Bible (1560) and he allowed it to shape his use of the language. Every day, English speaking people across the world are using words, phrases and expressions that are straight from the Bible - though they are mostly quite unaware of this. The Bible stands alone among books not only because of its clarity, longevity and popularity, but because of the opposition it has attracted to itself. Throughout its history, even while it was being written, its enemies have tried to destroy it. It has been burned, banned and its readers have been imprisoned and murdered for reading it - and across large areas of the world they still are. The Bible is the handbook of Christianity. If we want to know what Christians believe, and if Christians want to know how they should live, it is to the Bible that we must turn. In every area of life it is assumed that a manual must be free from error if it is to be useful and, unless it is for specialists only, it must be fairly straightforward to understand. If those ordinary readers are to be found among various cultures, from the desert tribesman to the university professor, then the textbook must be unusual in its plainness and universal in its appeal. The Bible is unique among all the books ever written in meeting these requirements. 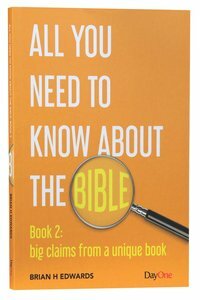 The first book in this series presents an overview of the great theme of the entire Bible. Whether we follow the promise of God to send a Saviour for the human race, or trace the history of God's chosen people, everywhere the Bible is pointing to Jesus the Messiah and then, in the New Testament, how the Messiah prepares for the future of his church. Some of the remarkable prophecies of the Bible - a significant problem for the critics - are examined in the second chapter. A chapter is devoted to the evidence of eyewitness accounts and how the Bible reveals itself as an authentic record of events that really happened. Which leads to the seemingly unnecessary question: 'Did Jesus really live?' Unfortunately, it is a question asked more now than ever before, although the answer is simple and decisive. There is not a single text in the first few centuries that questions the reality of the life and death of Jesus. Roman and Jewish historians and pagan philosophers and sceptics refer to the life of Jesus. They may doubt his resurrection and ridicule his miracles, but no one questioned that he really lived. Chapter five looks at some of the people and events referred to in the New Testament letters that reveal the letters to have been written well before the close of the first century and the death of the apostles. Finally, we examine evidence in the Old Testament that reveal it as a record of events that undoubtedly happened. Claims are made, information is given and phrases are used that would be impossible for a writer to 'invent' many centuries later. Along the way there are surprises and facts you may never have considered. This strong historical foundation of the Bible prepares us for Book 2 in which we consider what the Bible really claims for itself. It is this decisive claim that inevitably draws so much opposition. If the Bible is what it claims to be, it must be taken seriously - and the implications of that are enormous.